As I write this, our deck is covered in about 16 inches of snow where it hasn’t drifted, thanks to high winds, to over 2 ½ feet. Just one week ago, some of the Hartford, CT, area golf courses announced they would be opening in a few days. The day before opening, it snowed about two inches, certainly enough to dash the plans of even the most serious and sturdy of golfers (the latter is not me anymore). Yesterday, the snow had melted almost to the point of playability. But today, blizzard conditions not only put a blanket of deep snow over the area, but it also put a damper on any possibility of the golf season in southern New England starting before April 1. This is why so many of us long for a vacation home or permanent home in a warm weather area. (A friend told me on the phone that it was 85 today outside her home in Las Vegas.) It is also why I have seen an uptick in the number of questionnaires readers of my web site and newsletter have filled out in the last two weeks, about three times the typical rate this time of year. Snow is good for the guy who plows my driveway, for supermarkets and for me. But that doesn’t mean I like it. We golfers have an internal clock, and when Daylight Savings Time kicks in, it is natural to think the golf season should as well. For all you fellow New Englanders -– and this applies to everyone north of the Mason-Dixon line -– here is tomorrow’s weather forecast in selected cities of the Southeast. According to weather.com, there is a 0% chance of rain in every one of these locations tomorrow. Perfect sweater weather golf. The scene on the back deck of our home, and it is still snowing (and blowing). 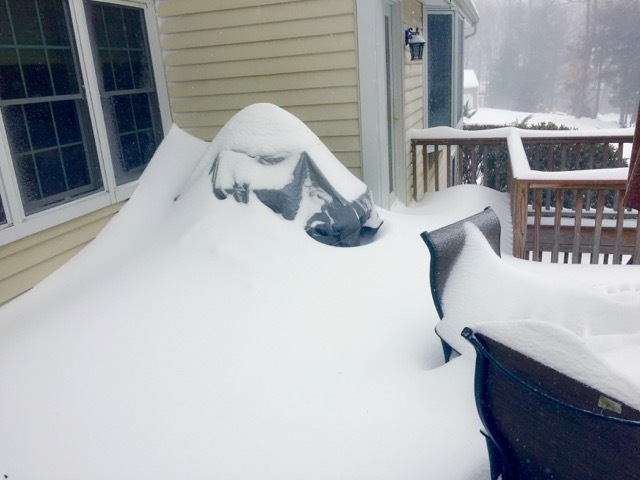 It will be a while before we can use the grill. All sorts of conditions are conspiring to make this a good year for those considering purchase of a golf home to get it done. Interest rates are still low, if you plan to borrow money; home prices have firmed up in many markets in the North, making it easier to sell a home and move on; home prices in many good golf communities were up even more last year, and as the baby boomer wave continues to move South, they should remain strong for the foreseeable future; and the cost of living differences between North and South means many couples will almost pay for their moves within a year or two with a much lower expense level. We are dedicating the March issue of our Home On The Course newsletter to finding a home within a year. Subscribe now to make sure you don’t miss this informative discussion of how to conduct the most effective search, one that will result not only in a new golf community home but one that matches all your requirements. The newsletter is free of charge. Subscribe here. Those inveterate golfers who love links golf in Scotland probably understand that many of the best golf courses on the Old Sod offer overseas memberships that are inexpensively priced. But for many of us who do not live near major city airports in the US, getting to Scotland (or Ireland) have made such memberships impractical, not to mention “expensive” given the cost of international air fares. But now, those cheap airfares characterized by Ryan Air and Easy Jet in Europe have crossed the Atlantic in the form of Norwegian and WOW Airlines and made membership in a Scottish or Irish club much more practical, even if you make just one golfing pilgrimage there each year. 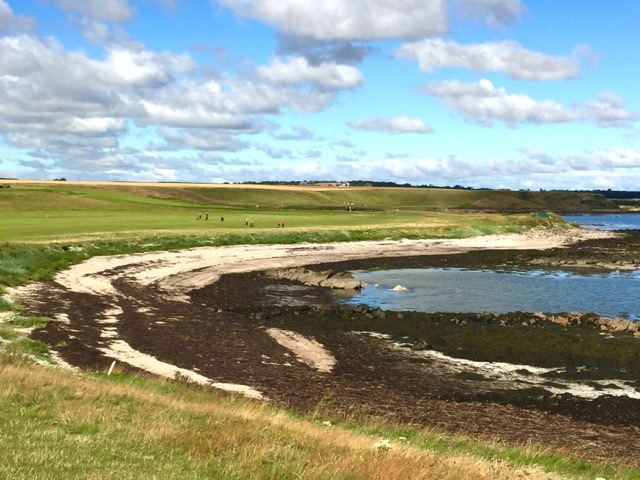 Old Tom Morris used all the elements at his disposal -- the sea, the beach and the natural links land -- to fashion a long par four on the front nine of Balcomie Links at Crail. In fact, I just applied for membership at the 7th oldest golf club in the world, Crail Golfing Society on the North Sea in the Kingdom of Fife, just 80 minutes north of Edinburgh and a mere eight miles from St. Andrews. By American standards, even for a semi-private club, membership at Crail is a steal and includes eight rounds of golf annually, four on each of Crail’s two courses (see below); free golf at Blairgowrie Golf Club’s three courses; deeply discounted rounds at Scottscraig, Ladybank and Lundin Links courses; and access to the Royal Overseas League club in Edinburgh, whose accommodations are reasonably priced (starting around $80 per night). The North Sea is in view from most holes on Balcomie Links. 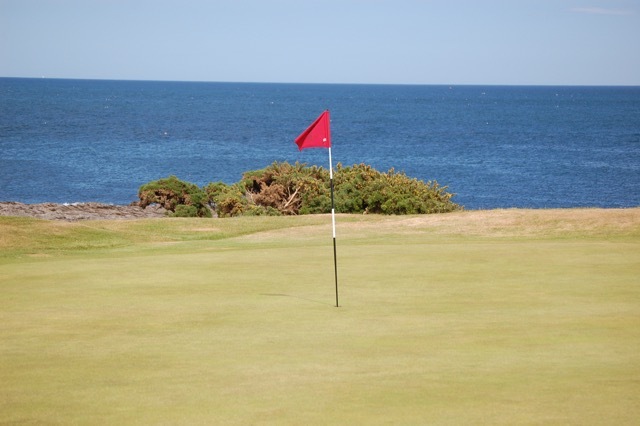 The initiation fee for an Overseas Membership at Crail, at today’s exchange rate, is about $209 and annual dues just $161, or about $20 per round if you were to play all your eight rounds on an annual trip over to Crail. For those who like to plan ahead, tee times for members can be made up to a year in advance. The two golf courses, Balcomie Links and Craigshead, make the most of the links land beside the sea. Balcomie, the old one designed by Old Tom Morris and opened in 1895, is buffeted almost constantly by winds off the water, and perfecting the knockdown shot is essential to a good score. 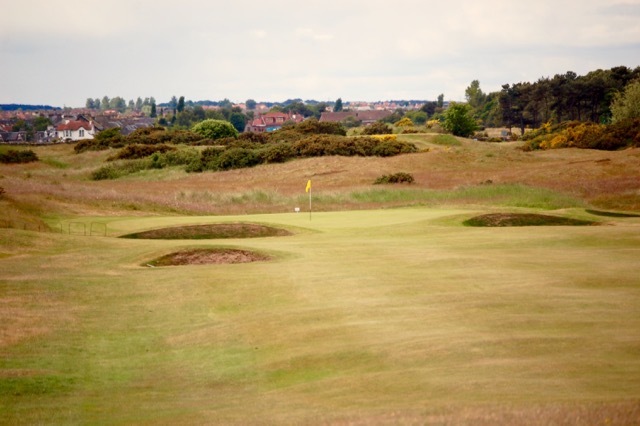 As on most links courses, the fairways are only faintly more hairy than the greens, and putting from as far as 20 yards off the green often seems a better option than trying a sharp strike off the closely mown and hard turf. Craigshead, which was designed by Gil Hanse in 1998, is the perfect companion to Balcomie because there is no mistaking its links orientation yet some greens are receptive to more traditional approaches, especially if the pin placement is toward the back of the green. Hanse certainly bowed to a kind of quirky traditionalism by building a par 4 with a native stone wall sitting just beyond the range of a three wood, and creating a green that is bordered at its back edge by another wall. Gil Hanse's Craigshead Links might be 100 years more modern than Balcomie, but it still shows flourishes of tradition, including a wall behind a par 3 green. For those seeking a more permanent vacation in Crail, cottages in the postcard perfect seacoast fishing village start around $250,000 US. 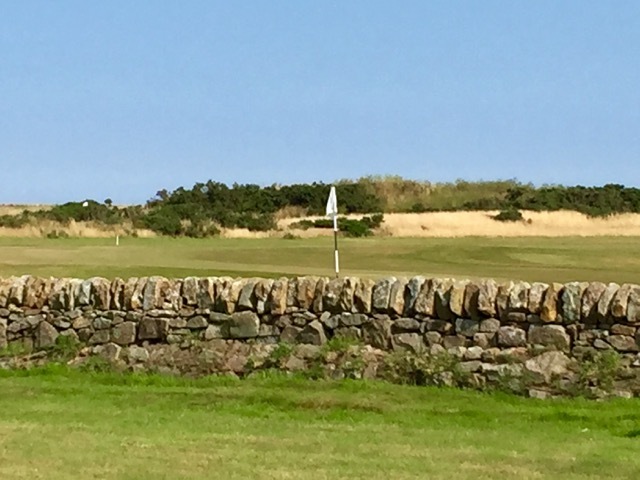 Besides a "free" eight rounds per year on the Crail courses, Overseas members receive deeply discounted green fees at other local courses, including the fine Lundin Links. Baby boomers in search of reducing their expenses across the board may want to look beyond North Carolina to its neighbor immediately to the South. A recent Wall Street Journal article, citing The Tax Foundation, indicates that state taxes on gasoline at the pump are twice as high in North Carolina as they are in South Carolina. North Carolina charges motorists 34.6 cents for every gallon of gas, second only to Florida among Southern states; the Sunshine State pumps 36.8 cents from every gallon of gas. South Carolina, on the other hand, assesses motorists just 16.8 cents per gallon, the second lowest in the nation after Alaska (12.3 cents). The differences in gas tax assessments certainly are not reflected in the differences in the prices of a gallon of gas. But there is a correlation between states with the highest taxes and the overall prices per gallon. The gas companies, after all, must have their profits. According to AAA, the current prices of a gallon of gas in the three states is $2.03 in South Carolina, $2.19 in North Carolina and $2.28 in Florida. The differences certainly aren’t enough to swing a decision one way or another on which state is the best for relocation. But one thing is for sure; moving from a high gas tax state like Pennsylvania, where the gas tax will amount to $3,026.40 annually on the same basis as above, will help save serious dollars for those who burn a lot of gas. The cost of a gallon of gas today in Pennsylvania averages $2.53. Moving to South Carolina from Pennsylvania will save 50 cents per gallon, or roughly $390 a year in gasoline (based on one fill-up per week), enough to pay for golf club dues for a month, a few great meals in Charleston, or a brand new Titleist driver. The full article in the WSJ can be accessed here. If that doesn't work, just send me an email and I will forward it to you. I have been reading lately about many golf courses that are being threatened with development. This is personal to me in that the golf course where I learned to play the game in New Jersey was plowed over to make way for the corporate headquarters of a cookie company. Many of the troubled golf courses today are inside the boundaries of planned golf communities, and the new owners of the clubs want to add more houses where fairways and greens now stand. Assessments are those annoying, and sometimes large, payments club members are asked to make when an unforeseen event occurs that cannot be fully covered, or covered at all, by insurance. Clubhouses sometimes burn down. An exotic fungus chews away at greens and fairways. A guest of a member goes off a cart path into a ditch because of an alleged faulty golf cart and sues the club. A hurricane blasts into the community head on, or a mudslide wipes out a few holes of the golf course. Ask about the history of assessments at the golf community club you are looking at. If there have been none or just the odd one or two, you may learn that the club had more than adequate reserves. Call it a rainy day fund if you’d like. This is a pool of money that is built up over time by directing a small amount of members’ dues payments to the fund. If the reserves are high enough to cover virtually any contingency, you shouldn’t have to worry about future assessments. 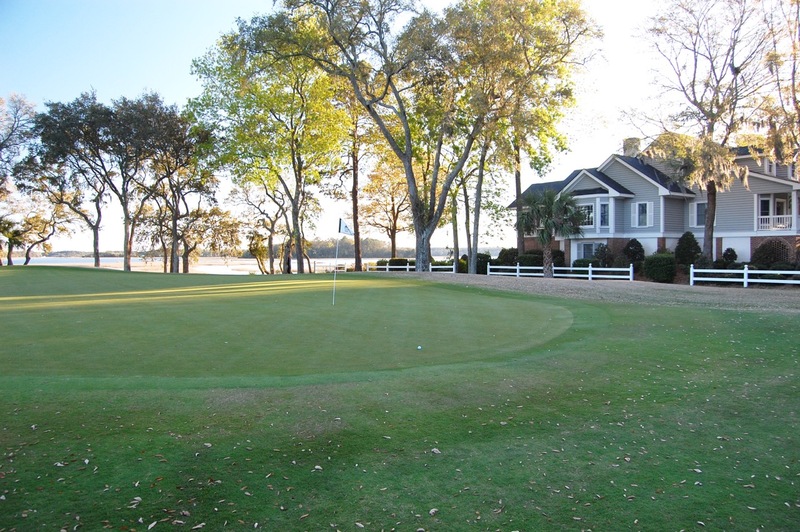 The reserve fund for Cypress Landing's golf club in Chocowinity, NC, amounts to more than 10% of the club's annual budget. Who Owns the Golf Course? There is a direct correlation between the quality and health of the golf community’s course and its real estate values. A developer who has sold out all or most of the properties in his community, but retains ownership of the golf course, may not care who is the next owner of the country club. All things equal, the most stable owners of the golf club are residents of the community because of their vested interest in keeping the club at the highest quality to protect their real estate investments. To encourage sales of properties in a new development, many developers promised property owners the right of first refusal to purchase the country club at a pre-ordained price when the community was mostly sold out. In other cases, the developer takes over the club and either runs it, hires a management company to run it, or sells it to another party. In any of those cases, a prospective member should ask some tough questions about plans for the golf course and about the management track record of the owners. A golf community country club run by its members is no guarantee it is run well, although we are hard pressed to find examples in which members mucked it up badly. However, members of a board may argue about investments for the golf course and clubhouse, and those disagreements can spill over into operations. Some board members, used to telling people what to do during their business careers, instinctively think they can run a golf club. That is a mistake. If you are serious about buying into a golf community and want to know how the country club is run, ask to speak with a member of the Board of Directors or, better yet, ask to sit in on a meeting. Most Boards invite their members to all their meetings, and they should be totally fine with inviting a prospective member. 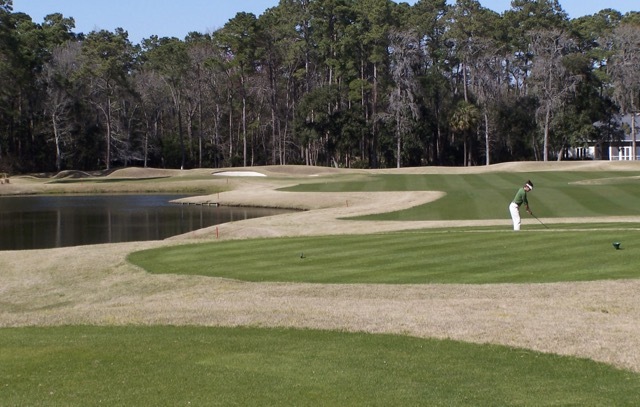 Members of the six golf courses at The Landings outside Savannah, GA, not only own the golf clubs but also the on-site real estate agency and every other aspect of the community. It is true that roughly 50 percent of people who live inside the gates of golf communities do not play golf; and not all of them sign up for social memberships. But it stands to reason that the higher the percentage of residents who are members, the more support there will be for the club’s operations. (Note: Some communities insist that anyone who purchases property must join the country club, an obligation that is too binding for many people but which does, in theory, produce the most stable club financially speaking.) In terms of marketing the community to the outside world, an activity that helps prop up real estate values, the perceived quality of the golf course is key. But if the property owners association (POA) comprises mostly non-club-members, it could be tough to develop a coordinated marketing strategy; and that could fray relationships between the parties. When you visit a golf community, ask about how the club and community work together on marketing; if you find that each entity contributes financial and human resources to the effort, you can be confident that relations between club and community are productive. All in all, the safest golf community club is one owned by its members, with no history of assessments, a deep well of contingency funding, and an understanding among members and non-members alike that the perceived health of the golf club reflects well on the community’s real estate and stabilizes property values. It is a brutal reality of real estate pricing that the desirability of a particular area generally determines price. It makes sense; if many people want to live in a certain place, demand goes up. If supply doesn’t keep pace, prices rise. There are still urban areas in non-temperate climates that are magnets for jobs and, therefore, families. Given the steady demand, many baby boomers who have lived in such places for decades are looking to unload their homes and move to lower cost areas of the South. But where are the bargains? The South isn’t quite as settled as other regions of the country and, therefore, it is possible to find great towns where the average price of a home for sale is less than $250,000, according to Business Insider, an online service. We don’t know much about Fayetteville, AR, the #1 city on Business Insider’s list for reasonably priced real estate, but we intend to visit there in the coming year and find out what is so special (besides low-priced homes). We are much more familiar with the seven other Southeast cities that made the top 25 list, including: Raleigh/Durham at #2, Charlotte at #8, Sarasota (#14), Richmond, VA (#16), Charleston, SC (#19), Greenville, SC (#20) and Tampa (#24). Raleigh/Durham pops up on virtually every best-place-to-live list for its abundance of employment opportunities, top-flight services and entertainment options, a major airport hub from which you can fly to many international locations, and multiple major universities. Oh, yes, the Raleigh area also offers plenty of golf communities to choose as well. A couple of our favorites are Governors Club in Chapel Hill, with 27 holes by Jack Nicklaus; and Treyburn in Durham, a sleek Tom Fazio layout embedded in a beautifully treed neighborhood and part of the McConnell Group of golf courses (one membership yields access to a dozen great golf courses). But those choices only scratch the surface in this megalopolis of opportunities. Treyburn Country Club was designed by Tom Fazio and is at the heart of a Durham, NC, golf community of the same name. 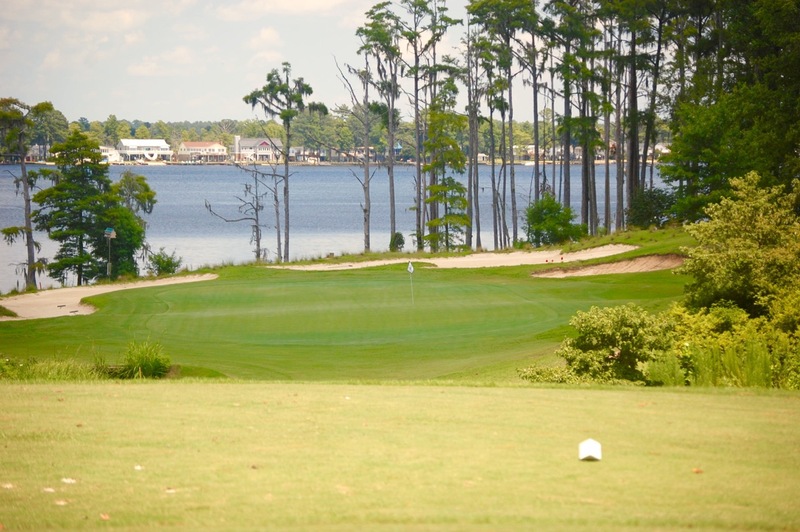 When you join Treyburn, you gain access to the dozen golf courses owned and managed by the McConnell Golf Group. Charlotte may have been a tad later in developing than was Raleigh/Durham but it has just about caught up in terms of what it offers relocating couples with an interest in golf. 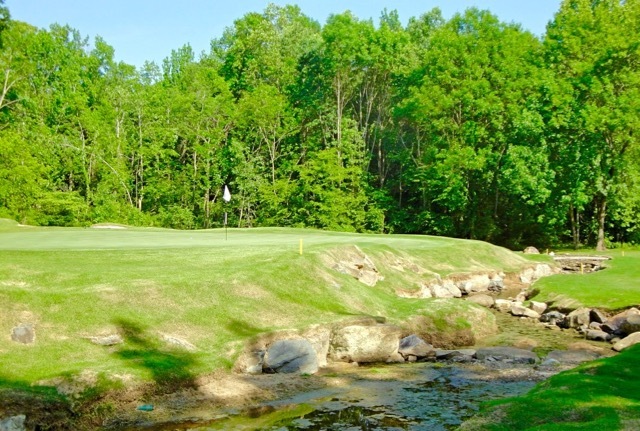 North of the city, sprawling Lake Norman was a natural for golf community development. Popular with those who work in banking and other key industries that have evolved in Charlotte, Interstate 77 helps folks get into and out of town efficiently so they have extra time to enjoy the amenities of lake living after work. Plenty of other golf community opportunities especially attractive to retirees ring the metropolitan area. If I had to choose a Florida city in which to live, it would be Sarasota for its location adjacent to the Gulf of Mexico, its sophisticated downtown vibe, and its emphasis on culture (e.g. the Ringling Museum). The huge Lakewood Ranch is almost a city unto itself with multiple golf courses, plenty of shopping and an intimacy that lives up to the promise of the “new urbanism” concept. As for Richmond, VA, we are perennially surprised that some magazine or rating agency hasn’t declared it a top 10 city for retirees. It has just about everything in the way of culture, great food, minor leagues sports franchises, universities that provide continuing education, and some friendly, reasonably priced country clubs, many at the core of golf communities. And although its location less than two hours south of Washington, D.C. is a mixed blessing -– proximity to the nation’s capital but occasionally dicey winter weather -– the pros outweigh the cons in this under-appreciated city. For a rundown on all of Business Insider’s top 25 cities with real estate averages under $250,000, click here. Ya Gotta Have Heart; I Almost Didn’t. To anyone searching this site for new material the last couple of weeks, my apologies. But I have a pretty good excuse. I had unscheduled quadruple bypass surgery last Tuesday and returned home from the hospital a couple of days ago. I am lucky. But that evening, the pain I felt in my chest was like nothing I had ever encountered. I know indigestion, and this was no indigestion. It was like two strong tug-of-war teams fighting hard, with the center of the rope at my chest. I had set up my "man cave" in the basement only a week earlier, and by the time I had made it up the stairs to tell my wife Connie of the pain, I was winded beyond relation to the number of stairs. I still wanted to believe this was a unique form of indigestion, especially since my half of the pizza we shared two hours earlier included anchovies, a food I eat rarely (and these were not the best-tasting anchovies). But after a few Tums and no relief, I thought we might be in heart attack territory. Lesson: Blood pressure readings tell you little about the state of your heart at any one moment. My wife and I took my blood pressure readings before the Tums (170/95) and after (138/90); the doctors later indicated neither was predictive of anything. The pain was so bad that I really had little choice other than to ask Connie to drive me to the UCONN (University of Connecticut) Health Center in Farmington, CT, just 12 minutes from our home. 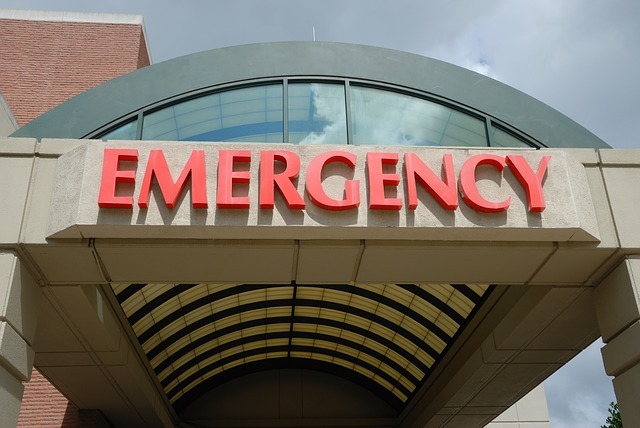 I would have preferred admission to Hartford Hospital, where I had an earlier surgery and a few other trips to the hospital's emergency room for me and my wife, but UCONN was half the distance. Lesson: Even if you think you can ride out the pain, or it isn't intense enough to check into, resist the urge to wait. Either call 911 -- I certainly had that option -- or if the hospital is fairly close, have someone drive you. Right away. I thought the admissions process in the hospital emergency room ‪at 9 pm‬ was a bit casual for a patient complaining of chest pains. (No other patients were in the waiting room or behind me in line.) I was not given an aspirin immediately, one way to address a possible heart attack, and since I was already in the medical center's computer system, I thought there were too many questions at that point. But the intake person was friendly, showed concern and ushered me into a room within five minutes or so. And frankly, I wasn't feeling any worse while I sat waiting. Lesson: Things don't always move in a hospital at a pace that seems reasonable. You're the patient (customer); you have every right to demand an explanation, if not action, when you believe you might be at risk. Many hospitals will send a representative to see you toward the end of your stay to ask your opinion about their services. That's nice, but altogether too late. I'll proceed quickly through the diagnostic stuff in the ER. I had none of the customary signs of a classic heart attack; no sweating, no pains shooting up and down arms, no nausea. 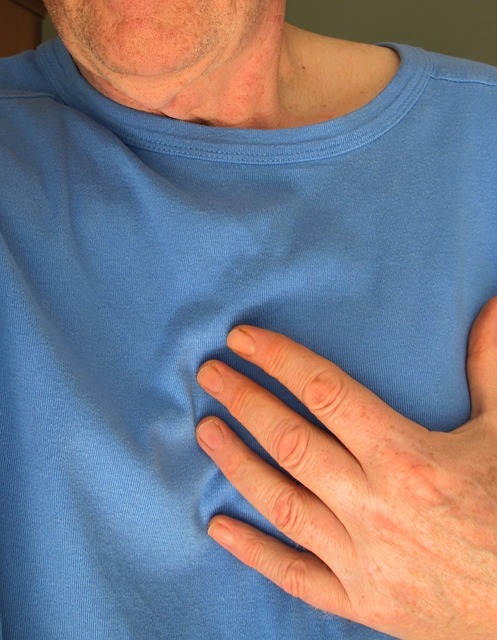 But the intense chest pains I described to the doctors and the fact that I am diabetic and take pharmaceuticals for high blood pressure and cholesterol gave them cause for concern about my heart. The only way they could conclusively decide about what was at the source of my pain was with an angiogram, an invasive procedure in which dye is shot through an artery, makes its way to your heart and renders beautifully contrasted photos of arteries and veins. Lesson: I thought a stress test was supposed to determine whether one had heart problems. Not so, said the doctors. I had a stress test -- intense walking/running on a treadmill while monitored by nurses and a doctor -- three years earlier in preparation for another surgery. But the stress test shows how strong your heart is, not necessarily whether there is any arterial blockage. And it comes with risks, especially if you are having chest pains. I opted for the angiogram, which was performed the morning after admission. They administered an anesthesia that permitted me to be awake, but only faintly so; if I had experienced pain, they wanted to hear me moan about it. But there was zero pain involved and the 45-minute procedure seemed to take 5 minutes. The pictures showed 90% blockage in three arteries. I was introduced to a surgeon, Dr. Daniel Fusco, who patiently explained the status of my heart and offered a Hobson's choice of two options. (Hobson is the guy who offers you a choice that is in the category of take it or leave it.) Choice one was triple bypass surgery, which carries an extremely slight risk of stroke or death. Choice two was to place stents in the affected arteries, basically providing a pathway for blood around the plaque-ridden areas. The problem with the second choice was that the size of one of the arteries was large enough that failure within a year or two was likely; but doctors do not typically open up a patient to do a single bypass. 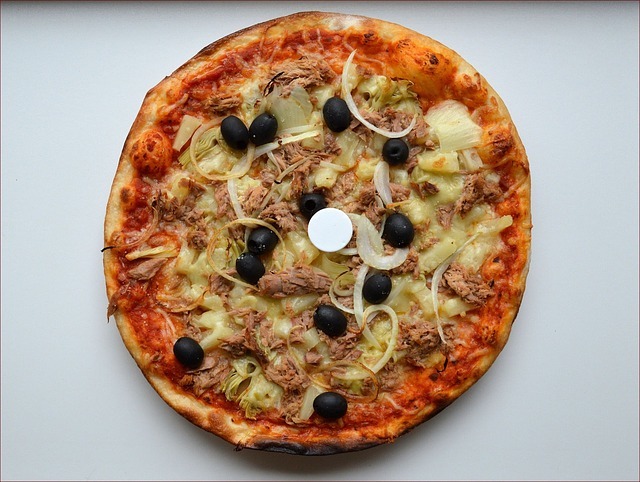 After asking all the questions I could, I was confident bypass surgery was the right approach. 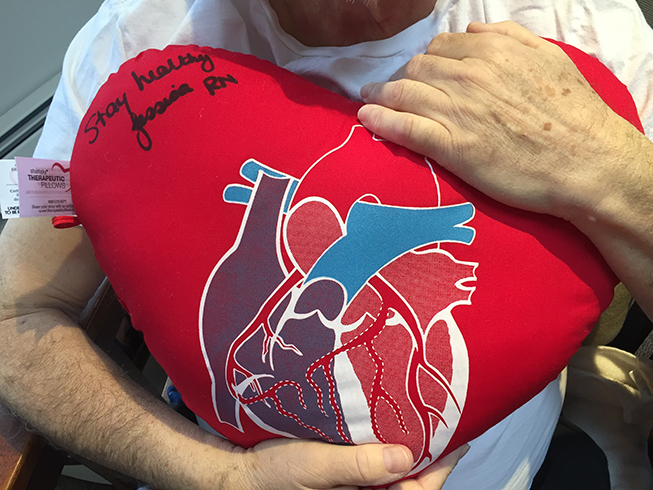 The hospital's cardiology nurses give you a cute going away present, a pillow in the shape of a heart. Some of them sign it. But the pillow has a practical use as well; when you cough after the operation, clutching it to your chest helps relieve some of the pain. Some. After the angiogram, surgery was scheduled for the following Tuesday. I felt well enough to return home for the intervening few days but the doctors insisted I stay for the extra prep necessary in the run-up to such a serious operation. It is not fun to be hooked up to a drip -- Heperin, to make sure I developed no clots before surgery -- and to have intravenous tubes that were only used occasionally...or to have monitors constantly beeping nearby...or to have your vital signs checked every four hours. A hospital is the last place you ever want to go for a good night's sleep. But the security of knowing I had immediate help within steps if something should go wrong soothed my anxiety about being away from home. Lesson: Listen to your doctors about length of stay in the hospital. Trust me, they want you out of there as quickly as possible to free up beds and deal with one fewer patient. If they say you should remain there for an extra day or two, believe it. The surgery itself was, of course, a non-event for me. That is, I slept through all of it and the total four hours passed as if it were just four minutes. In the hour before the operation, the attending nurse had trouble finding a receptive artery in my arm for the IV, but she was more upset than I (but not that upset). I had no weird dreams while under anesthesia, and I came out of the fog gradually but pretty quickly. When I awoke, my cheery-faced wife and daughter were at my bedside in ICU, indicating to me that something pretty good had happened (that I was still alive). At some point, whether compelled by relief or drugs, I mimicked the Schwarzenegger line and gasped, “He’s baaack!” My daughter liked that. I learned later, when I was a bit more awake, that a fourth blocked artery that was hidden from view (or just didn't accept any dye during the angiogram) was bypassed as well. Dr. Fusco had visited my wife and daughter in the surgery waiting room and told them the operation had gone "perfectly." 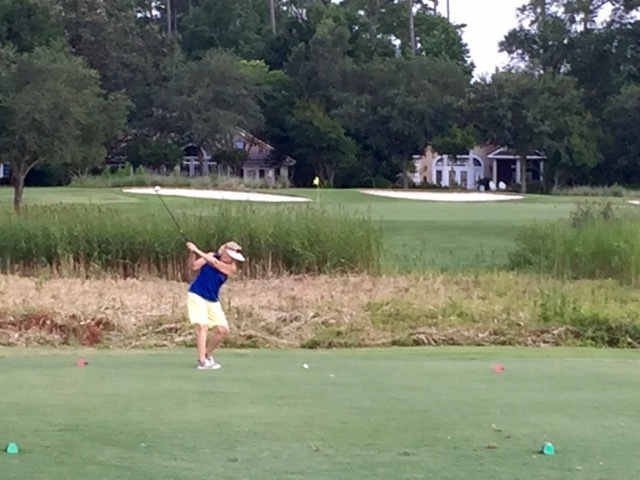 In the succeeding days, I felt as if that was not hyperbole; mindful that I was on some light painkilling drugs, I still felt wonderful, good enough to chip and putt. And toward the end of my four-day post-op stay, I was feeling especially good. But that was the painkillers talking and the fact that the incision area and cracked ribs hadn’t begun to heal, which is painful. 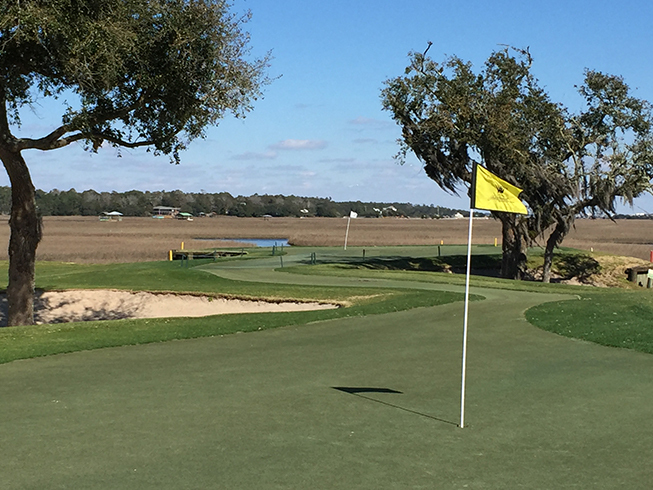 I am about 7 weeks away from my first round of golf which likely will take place at Pawleys Plantation Country Club. Chipping and putting will probably precede that by two weeks. Lesson: Do not be deceived if you find yourself in the same situation, feeling better than you expect. This is major surgery, you have taken a body check from the equivalent of a 240-pound hockey defenseman (or worse), and my first days at home have demonstrated that there will be pain (although nothing major and only in the incision area and part of the leg near the knee where they removed an artery to use as bypass material). I found I was allergic to the adhesive on the EKG patches they put on your chest, but a combination of hydrocortisone cream -- though applied nowhere near any incisions -- and Benadryl has helped. I understand there are changes I need to make to my lifestyle in order to keep more trouble with my heart at bay. Before this incident and surgery, I thought my heart was healthy, with no real family history, that the stress test I passed a couple of years ago was a sign of a strong heart and that my eating habits which, if not exactly heart-healthy, were not a threat. Certainly, I will be ratcheting back on the sodium intake, and the red meat I indulged every 10 days or so may become once per month, and less fatty at that. 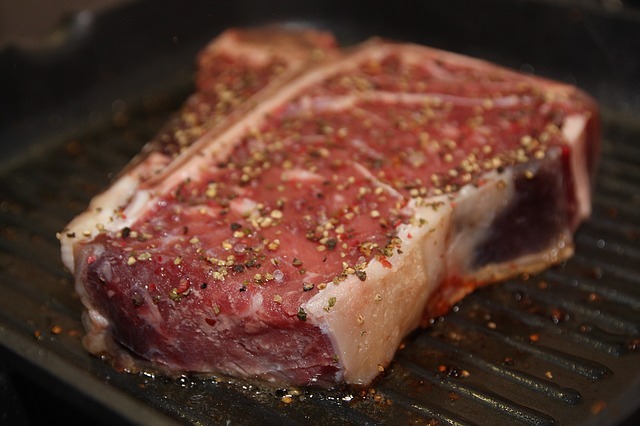 I like tofu, and there are a bunch of things one can do with tofu, although it will never be mistaken on my palate for a one-pound Porterhouse. One other lifestyle change I intend to make starting this summer: Limiting excuses for travel and exploration. There is always some convenient excuse for my wife and me not to travel: Get the house ready for sale in a few years, community or personal activities near our home in Connecticut, or as my beloved Brooklyn Dodgers used to say before they won their first World Series, "Wait 'til next year." No more; I just booked a Caribbean vacation for Connie, me, our grown children and their significant others this summer. Of course, a few nice golf courses are nearby.. If anyone has any questions, please let me know and I will be pleased to set up a dialogue. This was not an experience for the faint of heart (pun intended), and if I can help anyone feel more comfortable about it, that is the least I can do. Contact me by clicking here. If you are reading this, that means you either hung in there while I was gone, or you are a new reader. In either case, I am deeply appreciative. Thinking of Buying a Golf Home in the Next Two Years? In many of the top golf communities in the Southeastern U.S., prices rose in 2016. In some places the increases were more than 10%, in others in the five percent range. For a variety of reasons, prices decreased in a few excellent communities. Regardless, bargains still exist across the board if you choose wisely. Below are the lowest priced properties currently for sale in golf communities we have visited and can recommend. Of course, some of these homes will need a lot of work but the prices give a hint at the other bargains available. A new home is a big investment, and identifying the best possible location can be a challenge, especially in an unfamiliar area. We can help. 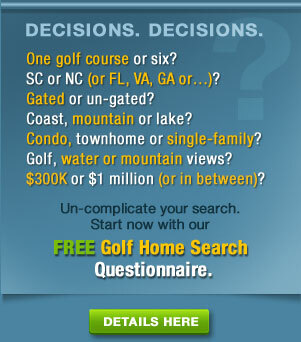 If you are planning to purchase a home in a golf-oriented area of the South, simply fill out our free, no-obligation Golf Home Questionnaire [click here] -- it takes less than 10 minutes -- and we will review your responses and schedule a one-hour complimentary phone conversation to discuss which areas and which golf communities best match your requirements. To whet your appetite, here are the lowest priced homes currently for sale in golf communities we know well. Start your search in earnest today. Fill out our free, no-obligation Golf Home Questionnaire, and we will schedule a complimentary one-hour phone discussion to identify golf communities that match your search criteria. Dataw Island is finally getting noticed -– by experts on planned communities and by retirees who know a bargain when they see one. I had a feeling Dataw’s time had come when, after my second visit two years ago, I wrote that the community was pretty near “perfect” in terms of location, given its remote feel yet proximity to the charming town of Beaufort to the west and an ocean beach in the other direction. The golf was darn good as well, 36 holes by Tom Fazio and Arthur Hills. Read my 2015 review here. 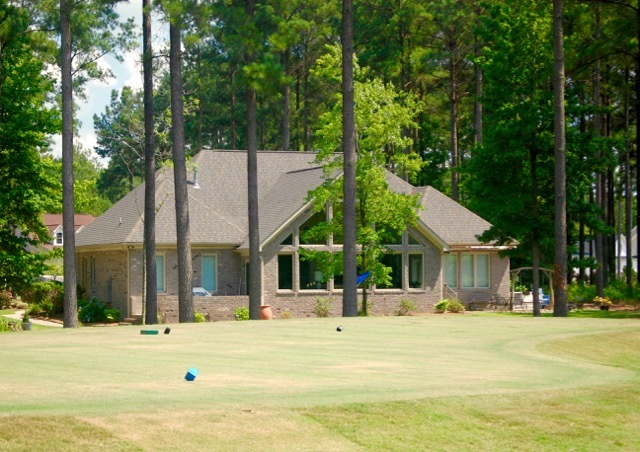 Many homes at Dataw have outstanding golf course views. It might be time to take a closer look, if not panic. Current listings show a lot of house available in the middle price range. For example, a $400,000 current listing has 3 bedrooms, 3 ½ baths, almost 2,700 square feet and excellent views of the Arthur Hills Morgan River course. I noted 23 listings under $300,000, a few of them townhomes; one home is currently priced at $95,000, and it has a nice golf course view! Nearby Beaufort is a full-service town just 20 minutes away, with a range of nice restaurants, good health facilities, entertainment options, shopping (the mall and boutique varieties) and a branch of the state’s university. The beach at Hunting Island is 20 minutes east on Highway 21. Parris Island and its Marine base is just as close which makes Dataw popular with former military officers. 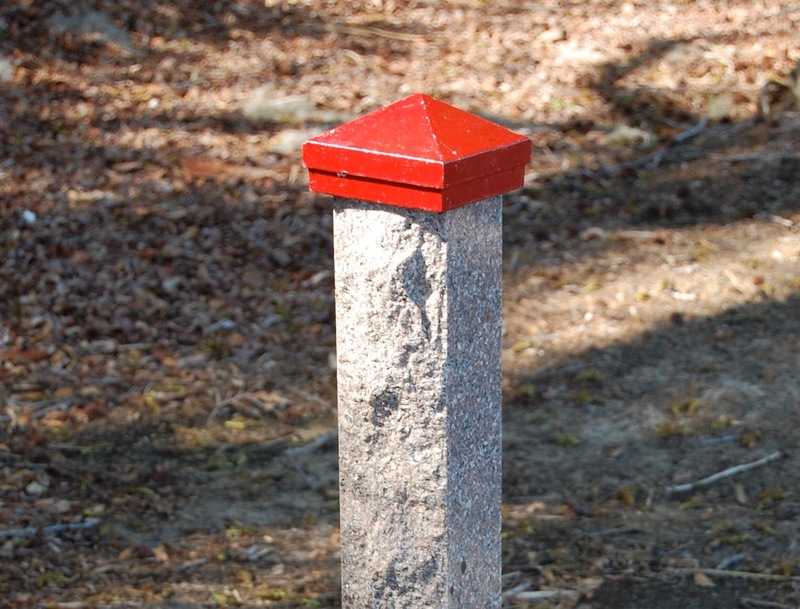 For those of us eyesight challenged, top caps on the 150-yard markers on Dataw Island's two golf courses indicate the pin position on the green. In her analysis, Margie pointed to the more than 20 clubs that are popular with Dataw’s residents, but the club I like best is the golf club with its two excellent layouts. On my two visits, I noted that the golf courses were well used by the membership and yet in really nice condition. The two layouts are different enough -– the Hills course more a parkland layout, the Fazio more a marshland layout -– that no member should tire of the diversity of play. Dataw Island is one of those grown-up communities on the coast that, after four decades of experience, seems to know what it is doing. If you would like a closer look, please contact me to arrange a visit.